Even if you're shelling out big bucks for a lightning-fast internet connection, there's inevitably a Wi-Fi dead zone in your house where the signal slows to a crawl. The trouble is most likely with your router's limited range, dashing your dreams of working from the hammock in your backyard or streaming music in the basement. Thankfully, NETGEAR just unveiled a way to extend your signal far beyond the meager reaches you're accustomed to. 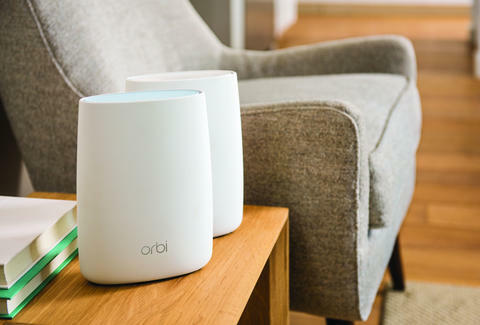 It's called Orbi, and it's a two-unit router system that promises to provide coverage of spaces up to 4,000sqft -- even through barriers like thick walls and staircases. The Orbi Kit includes two devices: a router and a satellite, both the size and shape of a small matte-white vase and totally devoid of any obnoxious flashing lights, so they won't be an eyesore sitting exposed in your living room. The former plugs into your modem, the latter sits in a central location, and setup is easy since they come pre-paired. If you're swimming in square footage and think you need even more coverage, soon Netgear'll also be offering add-on satellite units. Beyond extending how far you'll be able to wander freely with your laptop, the system's other standout feature allows you to browse at maximum speeds, no matter how many devices are connected to it. That's because it's powered by what's known as tri-band Wi-Fi, which allows the router and satellite to communicate on a dedicated channel, freeing up precious bandwidth for the rest of your connected devices. At $400 for the base kit, Orbi is roughly the same price as its competitor systems like eero and Luma, but both of those require more than two of their (slightly smaller) units to achieve Orbi's promised 4,000sqft of coverage. Not to mention, Orbi's the only one to feature tri-band Wi-Fi, ultimately making it the best option if what you want is both max speed and scope. Just be wary of any neighbors leeching off your Superman-strength Wi-Fi -- if you think you've got a squatter, here's how to boot them off. Joe McGauley is a senior writer for Thrillist who would conduct all business from a hammock if it were possible.